As a new premium product the book2net folio complements our portfolio of production scanners. Conceptually linked to the very successful series of the book2net kiosk, the folio takes over the premium qualities of this series which is appreciated by our customers as markedly robust, reliable, easy to use and durable. In particular, the innovative Matrix Sensor Technology has convinced many users, due to the exceptional image quality and extremely high productivity. 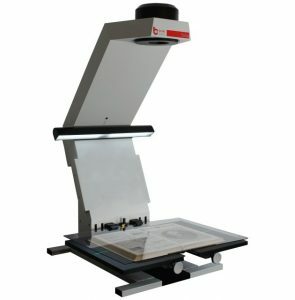 The book2net folio is specifically designed as a variable space-efficient production scanner for large-scale digitization of different document formats, providing a cost-effective scanning solution that meets the requirements of modern mass digitization combined with high application flexibility. With a layout section of 534 x 712 mm the book2net folio is particularly suitable for the digitization of different portrait and landscape formats, especially in the challenging area of historic formats beyond modern DIN standards. Historic books, newspapers or photographs, church and civil records, technical and architectural drawings, maps, posters, engravings or scores – the book2net folio covers all aspects! Highest flexibility — Take your choice! The self-adjusting book cradle and the optional Makrolon® plate open up a new flexibility for a wide range of templates: Fragile historical books, modern books, magazines, documents, files or ring binders, loose sheets in portrait or landscape format – you are free to choose! The self-adjusting preservation approved book cradle guarantees a particularly gentle treatment of the originals and allows a quiet, motionless scanning process. The adjustable spine-exemption allows a particularly gentle handling of very sensitive or thick books. The layout section is optionally provided with a special scratch-resistant film or a non-reflecting, smooth coating. The transparent and gentle Makrolon® plate can be flexibly used: it can be removed quickly and easily when needed.